Quilter, author, tutor, columnist, Jan T Urquhart Baillie has been enthusing others with her passion for quilting for more than 30 years. 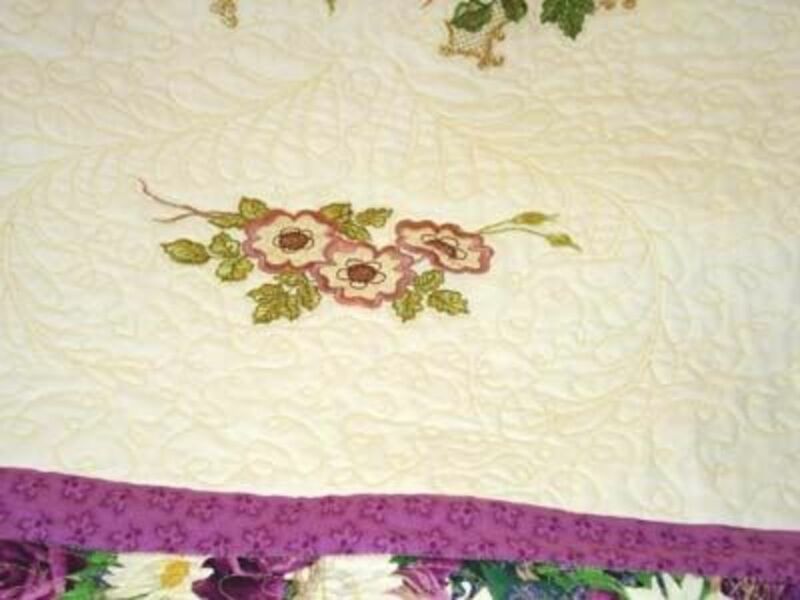 Let renowned Australian quilt tutor, Jan T Urquhart Baillie, show you her best tips for getting great results when free machine quilting. It's not hard at all. After you have done all the blocks, assembled them into a quilt top, the next stage in making a quilt is the quilting. 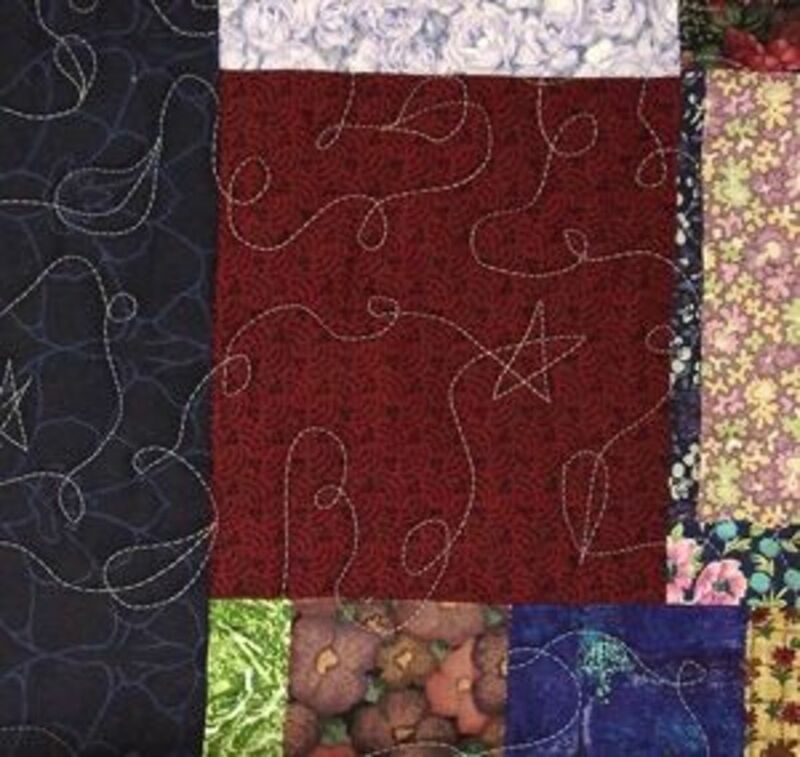 Free machine quilting is very sculptural, and makes a quilt truly beautiful. What on Earth Does Stipple Mean? In fact, most of the referances for stipple either refer to blood spots, or spotty effects on skin (making a stippled effect), or they talk about the paint effect technique of using a flat topped brush to dab (stipple) paint on a wall or surface for a textured (stippled) or spattered, look. Why would you want to spatter your beautiful quilt? Well I wouldn't spatter it with paint, but I might want to 'spatter' the quilt with heavy stitchery to create beautiful texture on the surface. 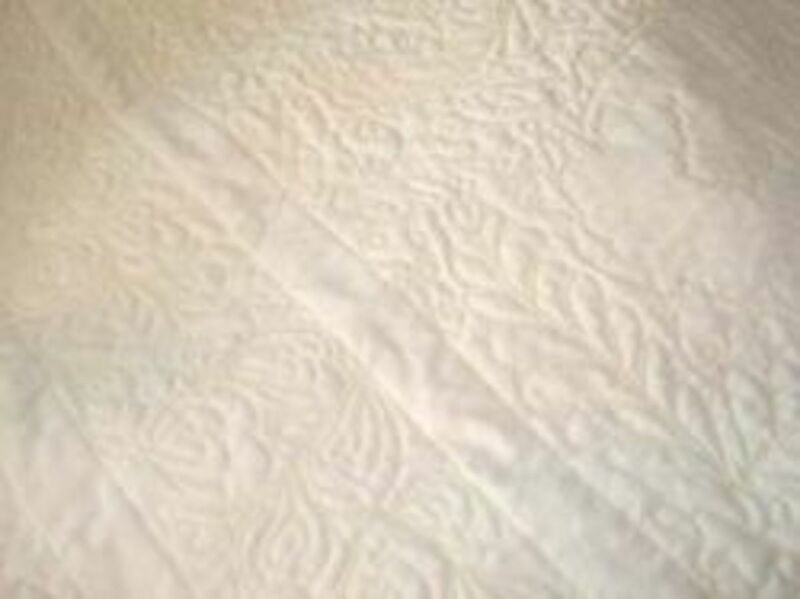 Stipple quilting is a term that has been coined to describe a particular form of quilting. Texturising the background areas with stitching is called "stippling". 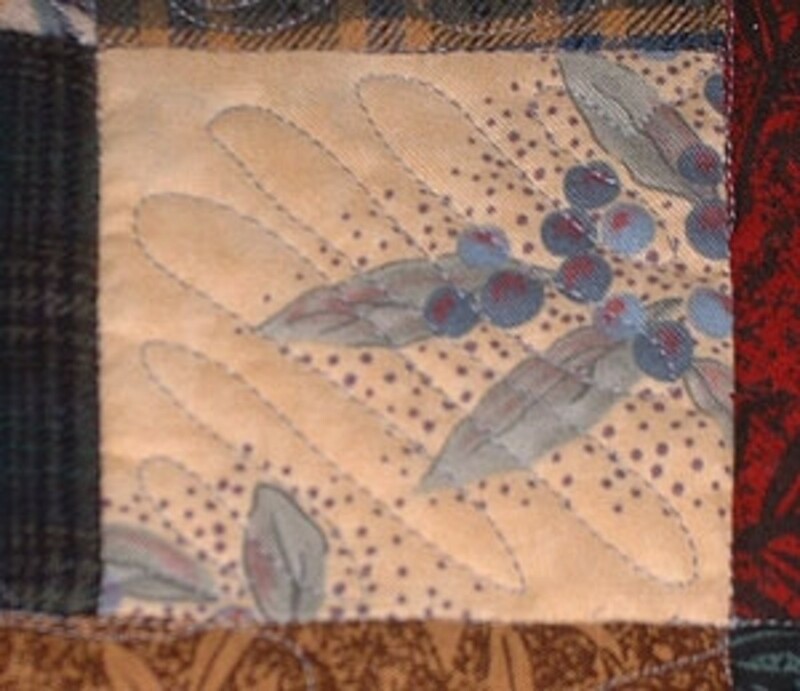 Background infill stitching causes the background of a quilt to be flattened, making the design part raised. The picture is the back of a quilt which I heavily machine quilted for a friend, Lorna. 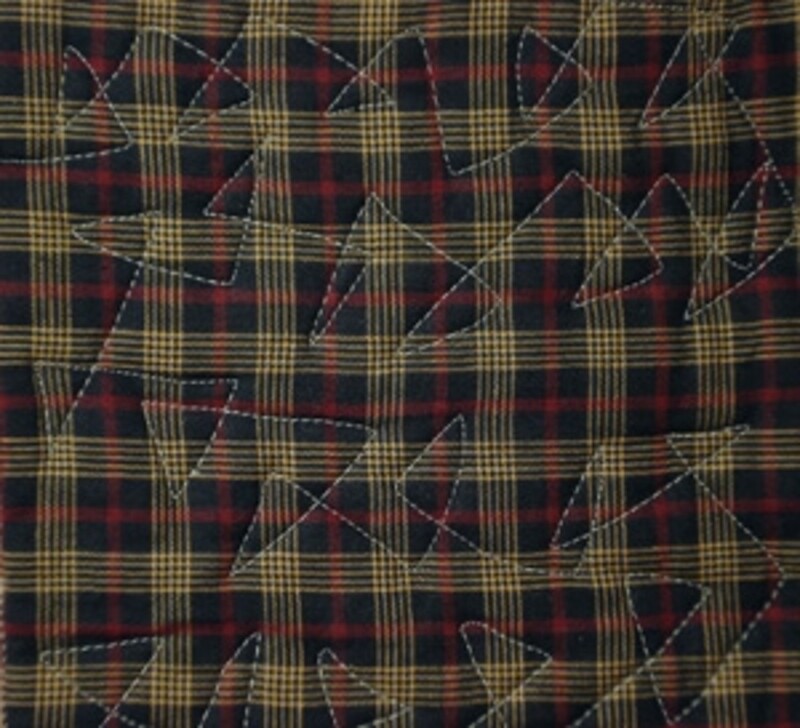 Notice the parts with no quilting? They are the embroidered areas on the front. I needed them to be raised, and so I didn't quilt them. 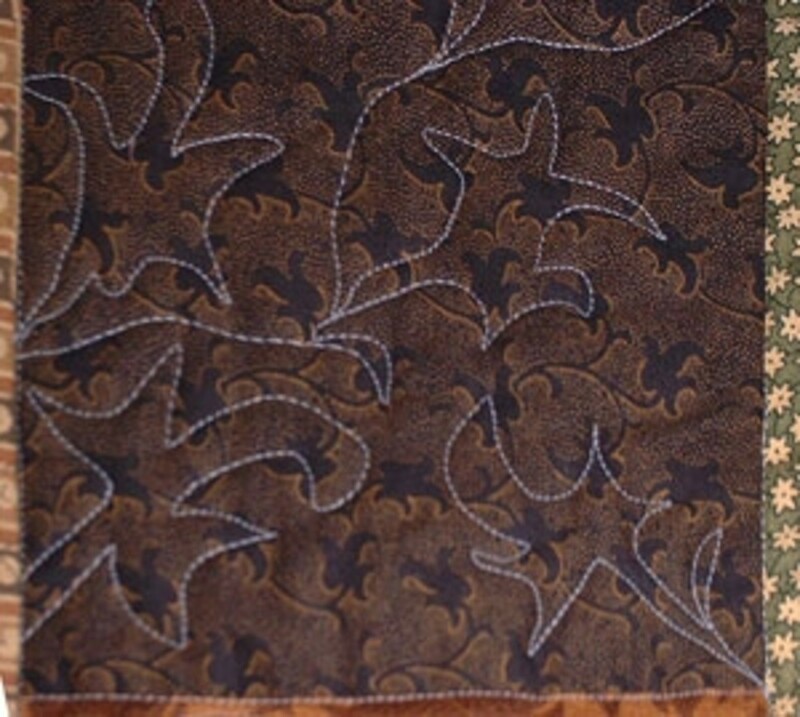 What Is Stippling On A Quilt? Stippling on a quilt is any background infill stitchery that flattens the background area to emphasise the main design. Quilt by hand or machine? The quilt police will tell you that stippling looks like the diagram at right. Actually, that's a traditional stitch called meander stitch. 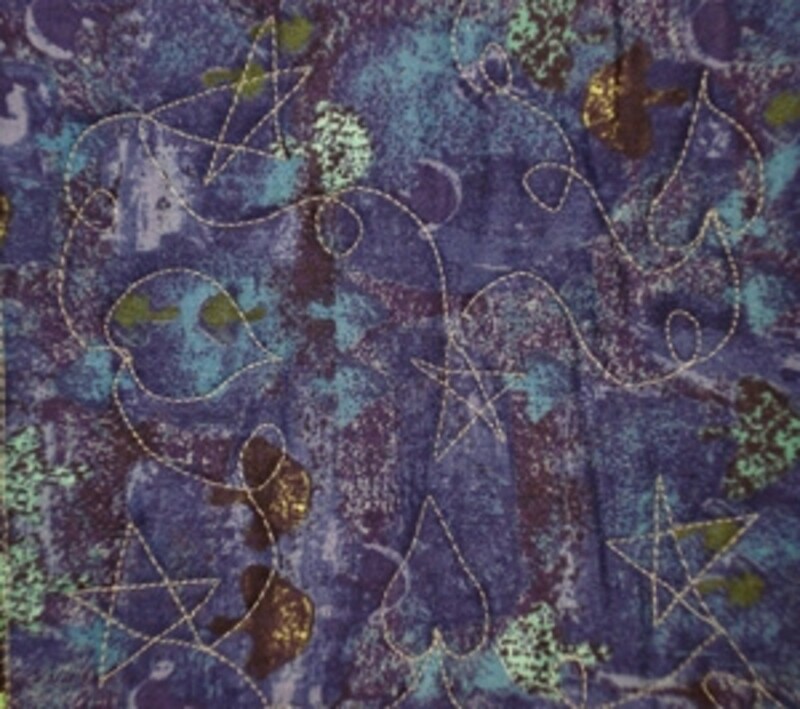 Similar in design to cornelli work used to embellish collars and epaulettes in the 1920s. The stitch is supposed to be curved and not cross itself. No angles. 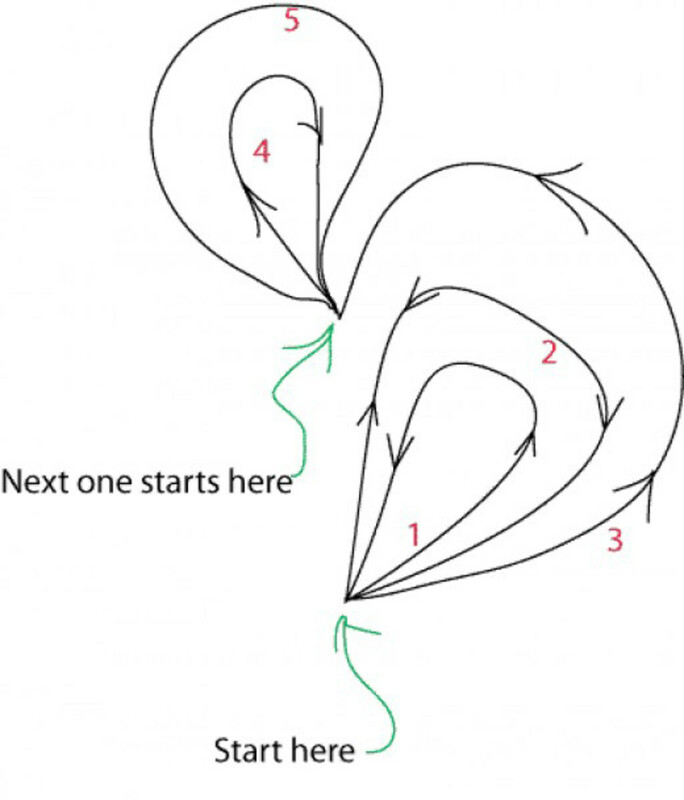 Meander stitch is too hard for a beginner. 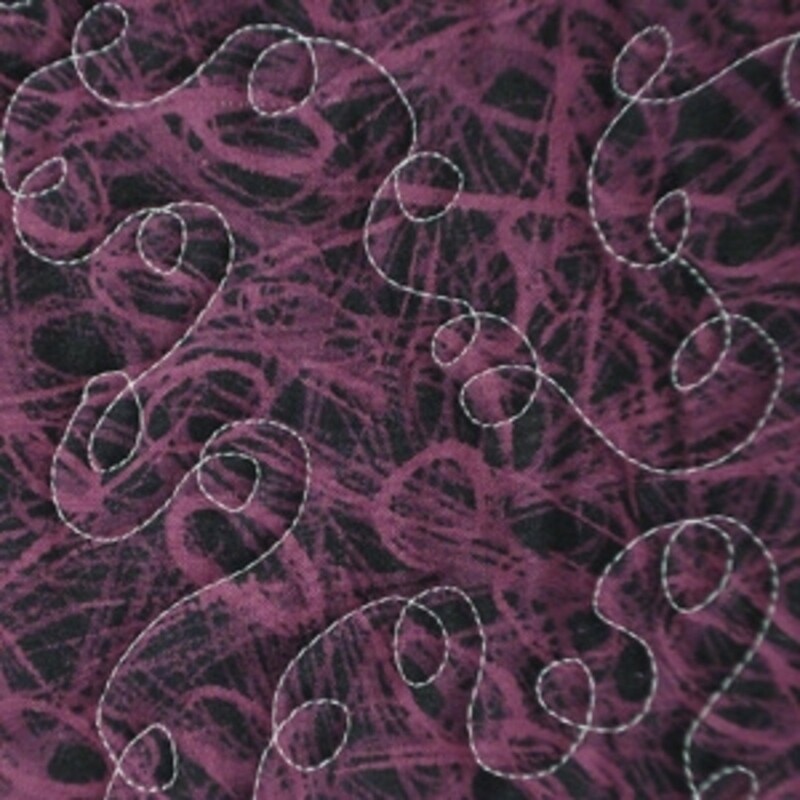 Garnet stitch is much easier for you to learn. You will experience no frustration and many variations are possible. Take the pen or pencil in the fist of your working hand, and hold it on one sheet of the paper, at right angles to the paper, in the top right hand corner. Draw the 'squiggles' of garnet stitch over the entire sheet of paper, without lifting the pen or pencil off the paper. It is important to be flowing, not straight lines, and remember, you can cross the previous lines. 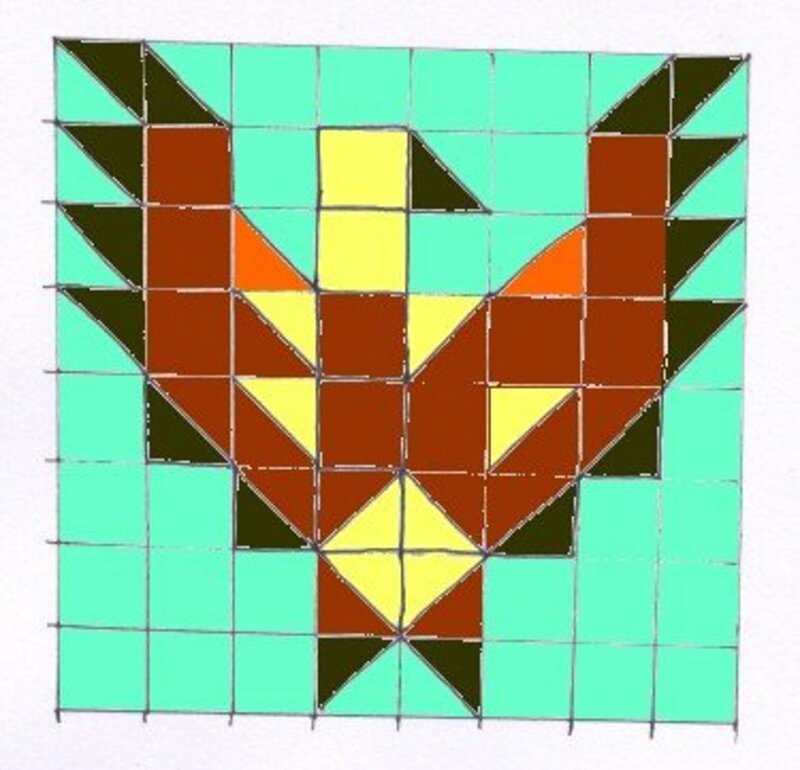 This is so you can get the pattern into your mind so it's instinctive when you are working on a quilt. On the other sheet of paper, repeat Step 1. This time, move the paper while keeping the pencil or pen still. This is completely the opposite of how you have drawn with a pen or pencil since you first learned! Why did I ask you to do that? Once you get it, you can try all sorts of variations. and the quilt is the paper. Now you know why it's hard to do at first. Practice makes perfect, well, nearly. Doodling with the machine. Go on, try it! I have watched and watched and learned so much. Love this guy's approach, his sense of humour, but mostly his skill. I began to sew what he calls Ricky Doodles. He does say that they are not something he invented, but an old pattern, so I can share it with you. You follow the diagram at right, and I urge you to practise on paper first. After watching Ricky Timms' DVD Grande Finale, I have been doodling away and it's really easy. 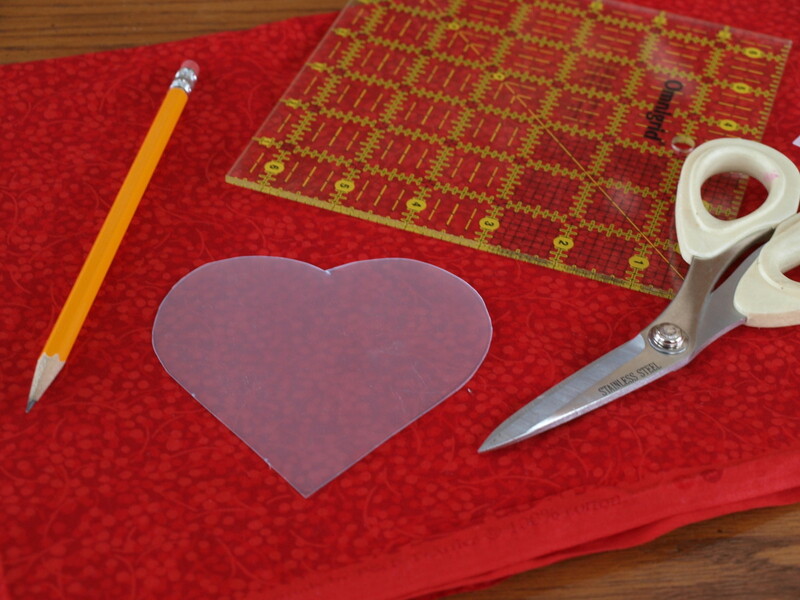 The feathered heart quilting was inspired by the embroidered heart designs that Lorna had worked on her quilt top. 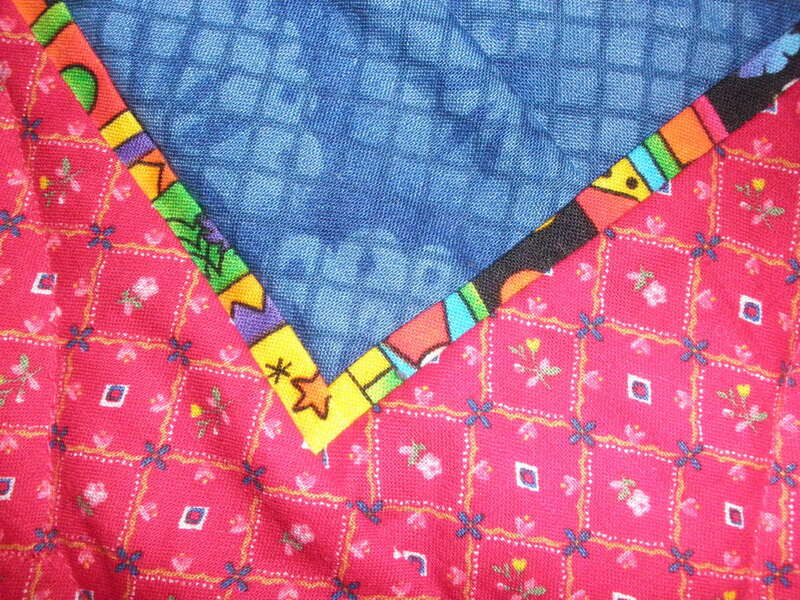 If you look at the quilt picture at the top of the page, there are heart designs in the four corners of the centre. I quilted this quilt in between watching Ricky Timms and Patsy Thompson show me how. The quilt looks wonderful. I wish I had been game and qtilued flowers on the border. Ah, there's always next time.Love the colours and fabric you used.Your daughter's bedroom and bed look fine. I can see her floor! I can't remember the colour of my son's bedroom floor. It hasn't seen the light of day or any light bulb for quite some time. LOL... I certainly wouldn't take any photos in there, unless it was for a horror movie!!!! Just wanted to say great lens! I love quilting and have made quite a few both for my family and also as gifts for others. 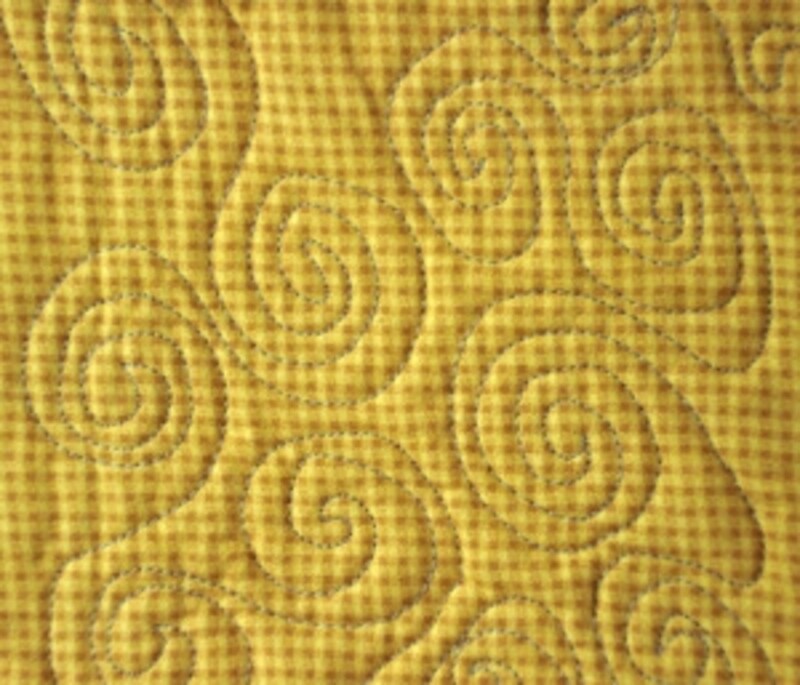 I have seen quilts with this kind of stitching, and they look awesome - I think I will try it on my next quilt. Thanks again for all the information you provided, it's been really helpful. What a treat it was to find you. Can't remember where I found you, but I'm happy I did. Browsing I saw your site and saved it until I could visit you. WOW! What a great teacher. 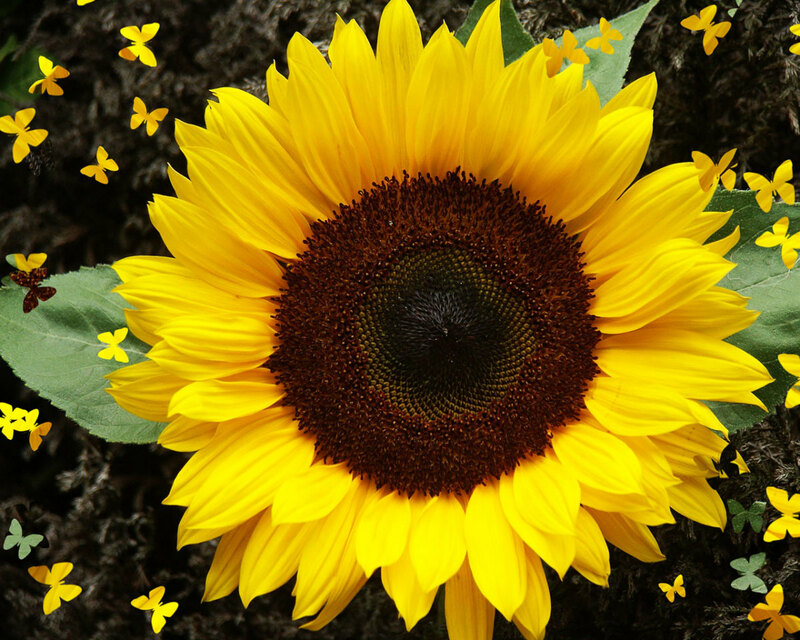 I am enjoying your teaching Thank you so much for sharing. 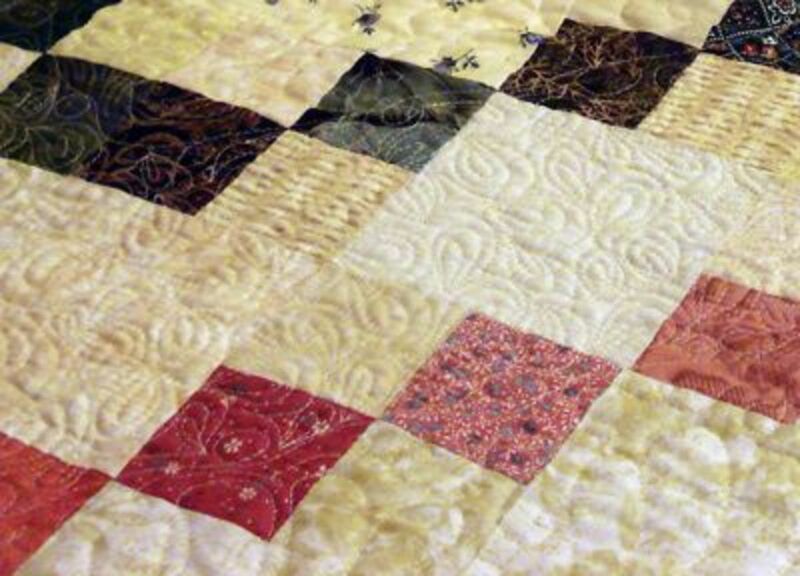 @MariaMontgomery: Did you do any machine quilting yet? I so enjoy quilting. I haven't tried stipple quilting but I'm willing to try. I really like the close up of the Doodling. Quilting seems to be somewhat of a lost art these days. Too bad, because I have seen some on Antiques Road Show that sold for thousands of dollars. They make for great family heirlooms. I don't quilt, but this makes me want to start machine quilting right now. Thanks for such a nice lens. @Ruthi: I used to do both, but quilting is my life nowadays. 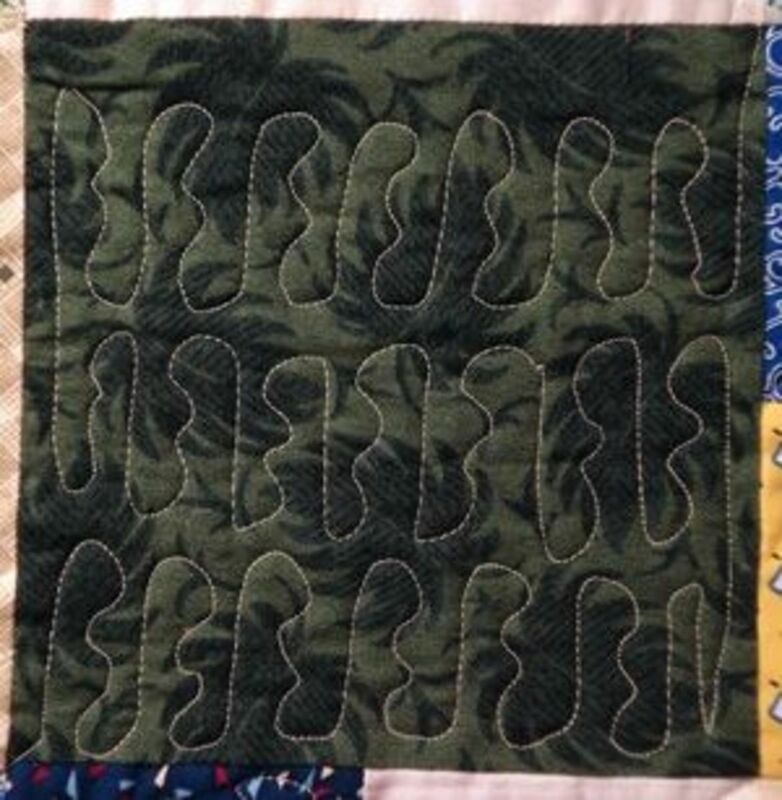 The stipple stitching really does highlight the quilting itself. Your quilt is beautiful! 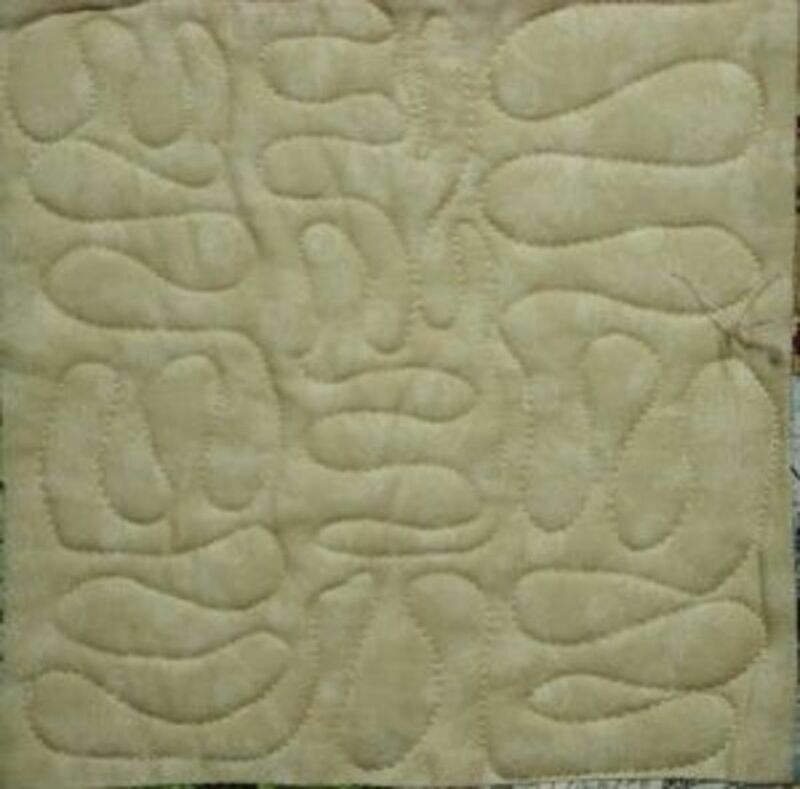 I have never attempted quilting. I am more of an afghan person; crochet or knit. I am highlighting this in my blog today....then I'm coming back to re-read the instructions. 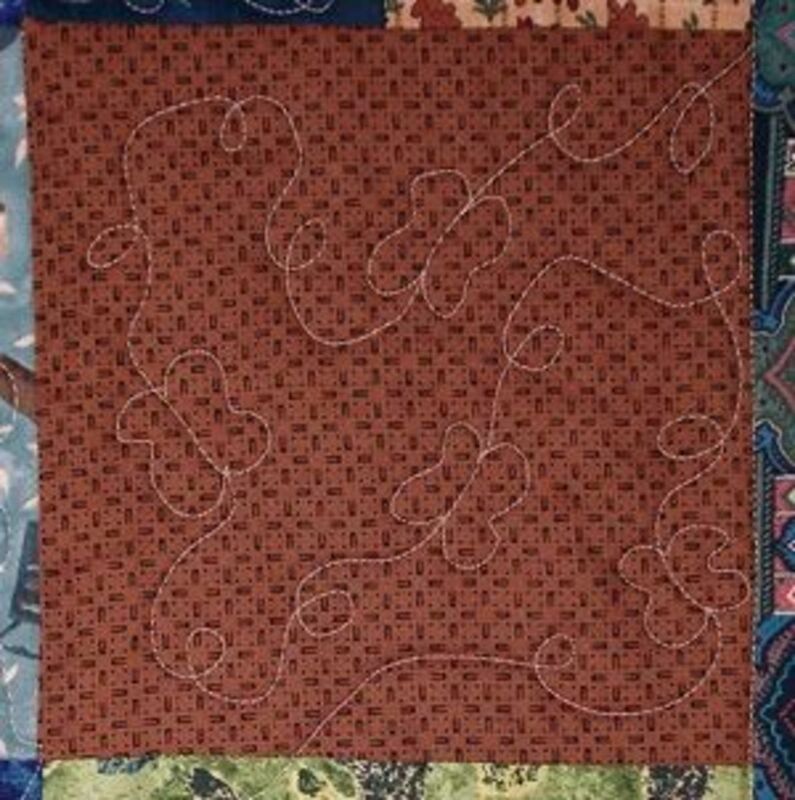 I so want to learn how to quilt with my machine. I love the look of stippling, but I am not good at machine quilting so I hand quilt so I don't mess up. @LaraineRoses: It's much faster using the sewing machine, and just as beautiful. Thanks for popping in. No questions but I want to let you know that I would love to stitch up a quilt. 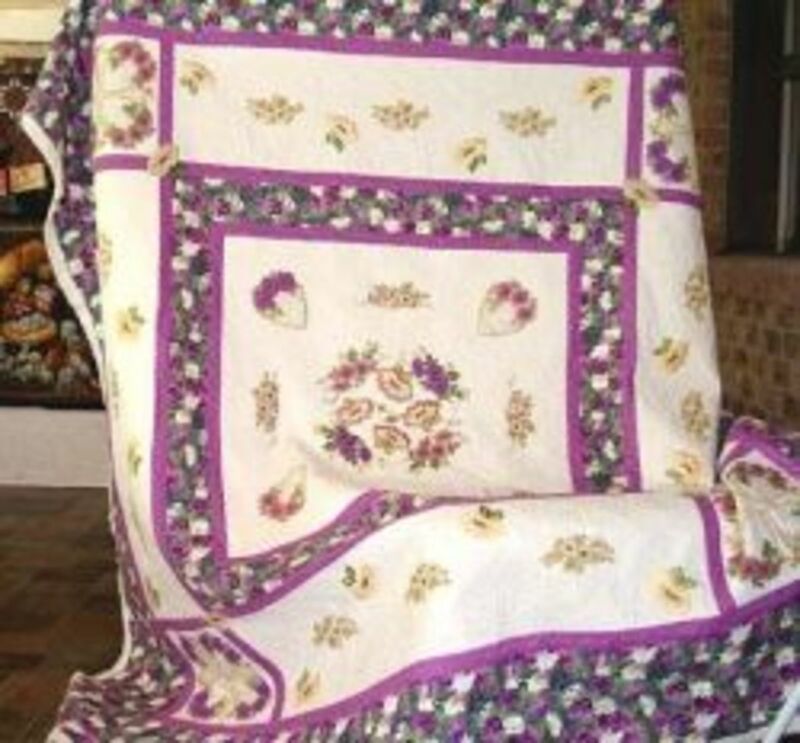 When I was a young girl my mum used to make quilts during the winter months. She had the neighbourhood ladies come and they took turns working on everyones quilts. This is where I learned how to quilt. All hand-done. I would like to try to use the sewing machine as you have shown us. Thank you. @Senora M: Thanks for the blessing and glad you came by! @Linda Pogue: Go for it! The quilt police aren;t watching! The foot has a finger, with or without prongs, which must be attached to the needle attachment screw. Your machine manual or your foot package may have instructions for doing this. How do I attach the free motion foot? Love your Lens. I will be back often to learn more about stipple quilting. Thank you. Cool lens. I taught myself to stiple using blogs, etc. online. It was hard (and ugly) at first, but now it's the only way I quilt because it's so fast!! I was taught how to stipple by a purist, and it scared me into not doing it at all. I really like what you call the garnet or granite stipple. I can do that! Thanks for the information! 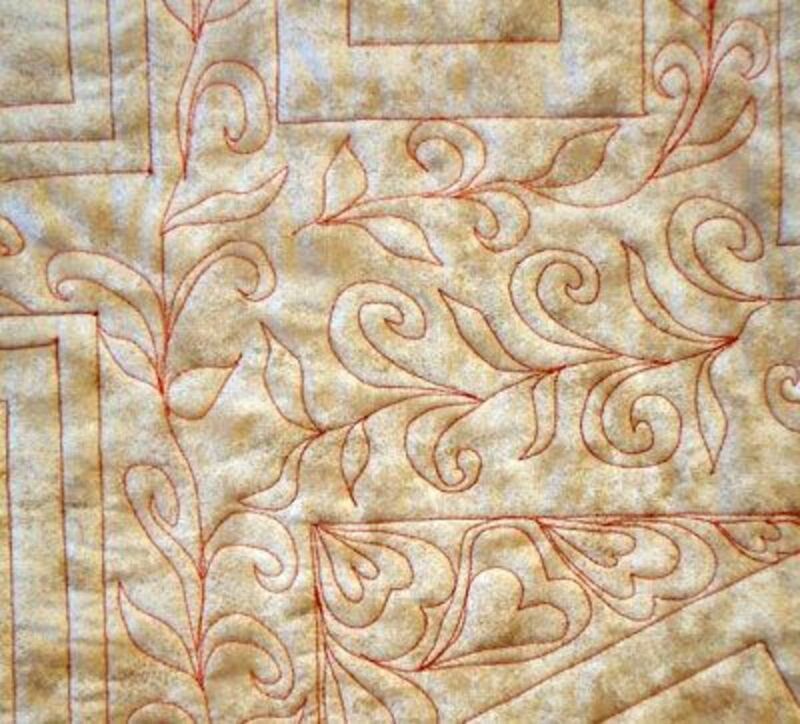 Great resource for anyone trying to figure out stripple quilting. 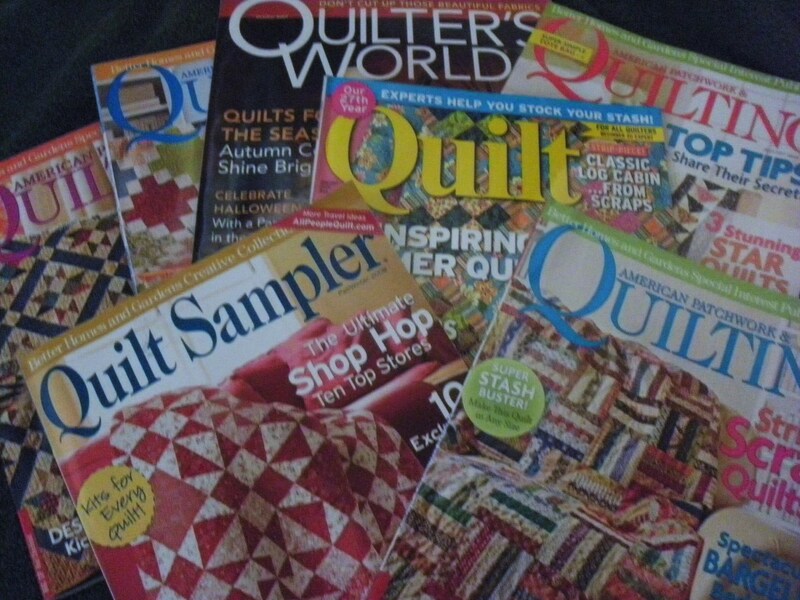 I see I am going to be busy checking out your many quilting lenses! I'm a beginner quilter, although I've made several...I'm now making really my first one that's not just squares. Thanks for the information I understand now and definitely will have a go. Great Lens. I am featuring it on my hand quilt vs machine quilt lens. Lovely. I've not idea what you are talking about but I love looking at all the different stitches. I've emailed this age to my mom who actually does quilt and would appreciate it even more than I.